1Visit EntroPay , sign up for a Virtual Visa account, then visit your email & verify Entropay account (This can take 1-6 days). Now login to your account & click "Add new card". Give your card a name. Ideally you should use your own name. 2Visit spending section, here either you can add Global Virtual Visa® Reward $5.00(550 points)/ $50.00(5200 points) to cart,then purchase rewards with points or cashout through Virtual Visa®. The order will approve in 1-3 days. 3Once approved check for an email titled "Congratulations! You are receiving a Virtual Visa®". Note: Every time on receiving Virtual Visa® (this email),you have to create a temporary account at Global Virtual Reward Center by clicking "Redeem My Virtual Card", this account will be created within 24 hours. You will then receive another email, this time "Your Virtual Reward Center account has been created!" It will redirect you to a page with a claim code. 4Now click on "Activate My Card", a login prompt of Entropay will open. 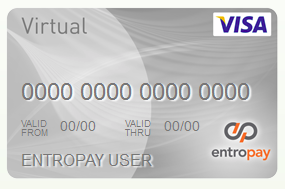 Login to your Entropay account , then select Virtual Card created before, use given code to redeem the amount. Visit Entropay and check the amount in your Virtual Card. Your card is now ready to use.